I’m the skipper again, today. I find out that it is a lot easier to sit and steer with something under my feet. We first think to use a six-pack of beer for that, but later decide for one of our folding crates. The weather is absolutely gorgeous, and sun cream is certainly needed. At lunchtime we moor in Lymm (no, not at the truck stop!). We do our shopping at Sainsbury, and eat a delicious salad at The Golden Fleece. Al fresco, in the beer garden, where it is almost too warm. Did the bridges on the Trent & Mercey have numbers, on the Bridgewater Canal they have names. And tonight we stop at Sale Bridge, which is (how amazing) in the Manchester suburb of Sale. 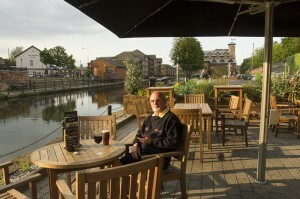 Next to the bridge is a nice pub, The Kings Ransom. Can we get any closer? As per usual we have a drink, and after that an excellent meal. When walking back to the boat I count my steps: 43 steps, and that’s on the way back. How much closer can we moor to a pub?